The Pearlscale Butterflyfish is a fancy fellow with its pearly white scales edged in black! The Pearlscale Butterflyfish Chaetodon xanthurus is a very pretty fish. It's moderate in size at about 5 1/2 inches (14 cm) in length but has an eye catching color pattern. Its body has black edged pearly scales that give it a cross-hatched or netted pattern overall. It is accented with a black eyebar to the front and a bright orange red on the rear. Thus it is known by several other descriptive common names including Yellowtail Butterflyfish, Crosshatch Butterflyfish, Netted Butterflyfish, Orange Butterflyfish, and Crowned Pearlscale Butterflyfish. This butterflyfish comes from Indonesia and the Philippines, so is also commonly known as the Philippines Chevron Butterflyfish. Despite its striking appearance this species is difficult to distinguish from some of its relatives. As a group these fish are members of the the "xanthurus - species complex", and they can only be identified if you know where they were collected. The very similar "look alikes" are the popular Mertens Butterflyfish Chaetodon mertensii and the Red Sea Chevron Butterflyfish (Red Pearlscale Butterflyfish) Chaetodon paucifasciatus, and they are each identified by where they come from rather than looks. This butterflyfish is moderately hardy and makes a good choice for an intermediate aquarist with some experience. It needs a good sized aquarium that is well established. A 55 gallon tank is the minimum size for a single fish, and a bigger tank will be needed if you want to keep more than one. Decorate the tank with rocks and/or corals with many hiding places along with plenty of swimming space. It swims freely and usually spends a good deal of its time in the open water, moving in and out of crevices. These are peaceful fish but they are also often shy. They can be kept in a community tank with other peaceful inhabitants, but shouldn't be kept with more pugnacious fish or they may refuse to eat. Subdued lighting can help initially in acclimating more timid individuals. After a period of adaptation they usually prove to be sturdy aquarium fish. More than one can be kept if they are introduced to the tank at the same time and they can also be housed with other butterflyfishes. Keeping this butterflyfish in a reef environment is a judgment call. Many reef-keepers hope to keep it in a mini reef and they can be kept with some of the more noxious soft corals, but like many butterflyfish it can be a coral eater. It is relatively safe with stony corals as long as the reef tank is large, well stocked, and they are provided with a proper and nutritious diet. However it does eat corals in nature and may snack on live polyps, so keep a watchful eye. Beautiful Philippine Chevron Butterflyfish (a.k.a. Pearlscale Butterflyfish) happily eating the remains of a shellfish! The Pearlscale Butterflyfish Chaetodon xanthurus was described by Bleeker in 1857. It is found in Indonesia, the Philippines, and north to the Ryukyu Islands of Japan. This species is on the IUCN Red List as Least Concern (LC). They have a wide distribution and there are no major threats currently identified. Other common names they are known by include Philippines Chevron Butterflyfish, Yellowtail Butterflyfish, Crosshatch Butterflyfish, Netted Butterflyfish, Orange Butterflyfish, Crowned Pearlscale Butterflyfish, Pearlscale Butterfly, Cross-hatch Butterflyfish, Yellow-tailed Butterflyfish, and Pearlyscale Butterflyfish. This fish is a member of the "xanthurus - species complex".. This complex is comprised of the Pearlscale Butterflyfish and two other species. They are very similar in appearance yet the regions where each of these fish are found do not generally overlap. The other two are the Red Sea Chevron Butterflyfish (Red Pearlscale Butterflyfish) Chaetodon paucifasciatus and the Mertens Butterflyfish Chaetodon mertensii. A fourth member once considered part of this complex is the Madagascar Butterflyfish Chaetodon madagascariensis, but it is now recognized as synonym of Chaetodon mertensii rather than as a distinct species. These butterflyfish are found at depths between 33 - 164 feet (10 - 50 m). Their natural habitat ranges from clear coastal to outer reef slopes and drop-offs where there are live coral reefs. Juveniles are shy and solitary and will usually be found staying close to sheltered areas. They usually live alone or in pairs and feed on small benthic invertebrates and algae. Social Grouping: Solitary - They are usually seen alone or in pairs, and juveniles are solitary. The Pearlscale Butterflyfish has a somewhat elongated, disc shaped body that is laterally compressed and it has a protruding snout tipped with a small mouth. The dorsal fin is continuous and it has a truncated tail fin. This species grows to a length of 5 1/2 inches (14 cm). The lifespan for most of the Chaetodon species is between 5 - 7 years, but sometimes longer with proper care. This fish is medium hard to keep and is suggested for an intermediate aquarist. They are rather shy so shouldn't be kept with more belligerent fish or they may refuse food. Subdued lighting can help initially in acclimating more timid individuals and offering live foods may help ensure they are feeding well. After a period of adaptation they usually prove to be sturdy aquarium fish. The Pearlscale Butterflyfish are omnivores, in the wild they feed on benthic invertebrates and algae. In the aquarium it is important that you feed a good variety. Offer a vitamin enriched meaty diet, dried flakes, shrimps, tablets and frozen foods of all kinds including Formula I, Formula II, Angel Formula and spirulina. Several sponge based frozen foods are now available and can also be fed to butterflyfish. Japanese Nori will also be favored. Feed it at least twice a day, and if it is a tiny juvenile feed it three to four times everyday. Acclimate with subdued lighting initially for more timid individuals and offer live food to help ensure they are feeding. Once adapted no special care or technique is needed to maintain this fish in the aquarium. Frequent water changes are not necessary, rather normal water changes at 10% biweekly or 20% monthly are fine. Sudden massive water changes can cause trouble. These fish need a lot of space to accommodate their size and to swim, they can reach about 5 1/2 inches in length. A 55 gallon tank is the minimum size for a single fish, and a bigger tank will be needed if you want to keep more than one. The tank should be well decorated with rocks and/or corals with many hiding places. In a reef environment this fish can be kept with some of the more noxious soft corals. This fish does not have a reputation as a coral eater but it may take polyps of some stony coral species, so it is not strongly recommended for coral-rich reefs. The best success is a large reef that is well stocked and a proper and nutritious diet is provided. Lighting Needs: Moderate - normal lighting - It can also be kept under bright light as long as some dark areas are provided. The Pearlscale Butterflyfish is safest kept in a large fish only (FO) or fish only with live rock (FOLR) community tank. In a reef it does well with soft corals and may be safe with stony corals. However it may eat coral polyps in nature and could snack on the polyps in the aquarium, so keep a watchful eye. This butterflyfish is prone to being shy if kept with other more aggressive tankmates, and it may then refuse to eat. More than one individual can be kept if they are introduced to the tank at the same time. They can also be housed with other butterflyfishes. 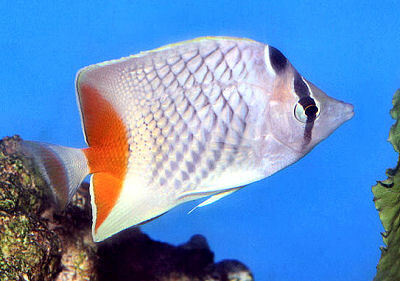 Smaller, non-aggressive fishes like cardinalfish, gobies, tilefish, sometimes other species butterflyfish, fairy basslets, fairy and flasher wrasses are good candidates as tank mates. Larger and rather territorial angelfish like Pomacanthus and Holacanthus can be kept together with this species. Also other angelfish like members of Centropyge, Apolemichthys, Genicanthus, Chaetodontoplus and Pygoplites also can be good tank mates. Small but very territorial fishes like dottybacks should be avoided. Such fish as basses or scorpionfish, even if they are small enough, should also be avoided. Same species - conspecifics: Yes - They should be introduced to the tank at the same time. Semi-Aggressive (anthias, clownfish, dwarf angels): Monitor - They are prone to being shy if kept with other more aggressive tankmates. The Pearlscale Butterflyfish may be sensitive to some drugs. Be sure to observe this fish closely when medicating it, so you can remove it if it shows signs of stress. For information about saltwater fish diseases and illnesses, see Aquarium Fish Diseases and Treatments. The Pearlscale Butterflyfish, also called the Philippines Chevron Butterflyfish or Yellowtail Butterflyfish, is available from time to time. It may be found online and sometimes in pet stores and is usually moderately priced. This fish was definately a little more challenging to keep. Though we got it to eat live daphnia(spelling? ), and then some scraps of cut up shrimp. It didn't eat at first, and it didn't eat at every feeding, but it figured it out. But it is so beautiful in our tank! The brilliant white seemed to sparkle in the light and this is one of my favorite all-time fish, bear in mind I haven't kept angelfish yet. I found when i was persistant and kept at it, we finally got it acclimated and it started eating progressively. One tip, I think it helps with new fish, especially if they are fresh from the ocean that it has some hardy tank buddies to "show it" the ropes and what is food in it's new tank setting. Like learning from observation. I have kept one of these for a little over 6 months now. They are very calm beautiful fish. Mine lives with a blue tang, blonde naso tang, orangefin tang, a sleeper goby, and a threadfin butterfly. This fish has never messed with any other fish. The blue tang used to try and pick on it because it was the smallest fish in the tank, but the chevron butterfly was always to fast for him. They get along fine now. Great fish!